Jim Williams, Region 1 supervisor for Montana Fish, Wildlife & Parks, measures the pending world-record bighorn ram at the Boone & Crockett Club headquarters in Missoula. The pending world-record ram skull and horns received an official entry score of 216-3/8 points Boone & Crockett. KALISPELL – Through conservation partnerships and critical habitat restoration, Wild Horse Island State Park on Flathead Lake has produced the largest ram in the world. 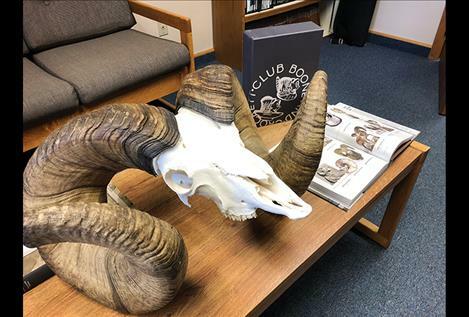 The Boone & Crockett Club on Feb. 7 confirmed that a 9-year-old ram that died of natural causes at the state park is pending as the new world-record bighorn sheep. The ram was officially measured at the club’s headquarters in Missoula and received an official entry score of 216-3/8 points B&C. The new score shatters the previous record by nearly 7 inches. The current world-record ram was hit by a vehicle in 2010 in Alberta and tallied a final score of 209-4/8. Montana Fish, Wildlife & Parks will offer the public a chance to see this historic wildlife monument at an upcoming public viewing. 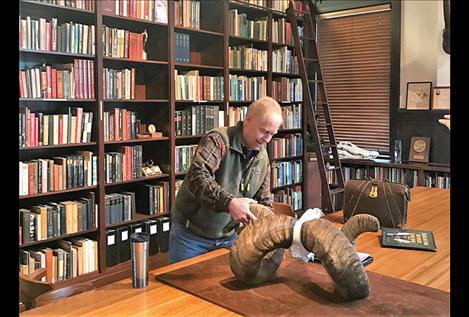 The ram’s horns and skull will be on display at FWP’s regional headquarters in Kalispell, 490 N. Meridian, between noon and 5 p.m., Friday, Feb. 23.